Simon & Schuster, 9781501110627, 352pp. Getting rich on Wall Street would be a lot more fun if the men would keep their hands off her assets. After twelve years on Wall Street, Maureen Sherry—formerly, the youngest Managing Director at Bear Stearns—switched gears to earn her Masters of Fine Arts at Columbia University, to write, and to tutor at inner city schools. Walls Within Walls—her first book, a mystery for middle school audiences—has been awarded curriculum prizes by the states of Texas and Connecticut, and she was named one of the Best New Voices by the American Library Association. Maureen is also an active board member of numerous charities. She lives in New York City with her husband and four children. "Sherry [is a] a former managing director at Bear Stearns who, lucky for us, didn’t sign a nondisclosure agreement when she resigned after 10 years with the company. With a sure hand, the author leads us onto the trading floor, where publicly demeaning a woman is a spectator sport.... When people of your gender make up 1?percent of the company, you just can’t beat ’em. So do you give up your seven-figure salary and move your family off Park Avenue? Sherry gives us a hard-won and satisfying answer." "Maureen Sherry’s comic novel unspools like a movie....I can just hear Cyndi Lauper’s version of 'Money Changes Everything' on the soundtrack." "Corporate sexism and the mortgage crisis are a laugh a minute...in this delightful comic novel, at least....So much fun, and educational too." "Working Girl meets Wolf of Wall Street in this in-depth, behind-the-pinstripe peek inside a temple of elite finance, navigated by a sharp, smart woman in an old boys' world." "Wow. This is the inside story we've been waiting for. Wall Street women never talk because their silence has been bought. Not Maureen Sherry. She tells her story of a working mother's battle against outrageous sexism and financial recklessness with laugh-out-loud insight and winning panache. Shocking and hilarious, Opening Belle is one woman's glorious revenge on the unreconstructed Tarzans of the corporate jungle. I don't know how she does it, but I'm really glad she did." 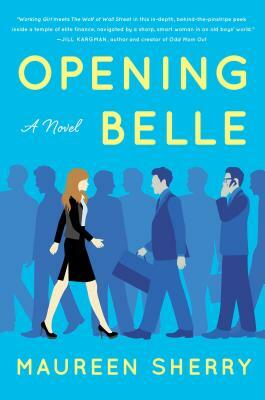 "Opening Belle is an irresistibly Zeitgeist-y novel about motherhood, marriage, misogyny, lust, ambition, discovery, disappointment, entitled nannies, and Goldfish crackers on the floor that (and this is big) rings true. But that’s not all. Sherry’s novel is also a delightfully funny and frequently damning participant-observer’s dissection of the secretive codes and practices of an elite, socially antediluvian tribe of men who, in a very real sense, run the world. For them, the bell has sounded." "Rooting for our girl banker/mommy/wife Isabelle is not tough; she is so brilliantly breezy. This book reveals the honest reality of a woman working in a man's world and still being treated like she's in an updated version of the cult classic 9 - 5." "This funny and fast-paced romp is sure to entertain." "This workplace novel that takes a fun look at Wall Street and the Park Avenue set is filled with humor and heart."